Painter, stage and theatre designer, born in China, educated in England and in Munich, Germany, prior to World War ll. 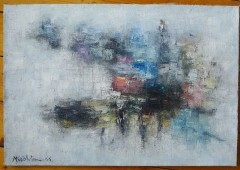 He exhibited with London gallery, Gallery One and in Newcastle and Liverpool shows of abstract painting. His solo exhibitions included one at New Vision Gallery in 1958, when his work was included in a show of British abstract painting touring New Zealand, Australia and South Africa. According to the New Vision catalogue, ‘Derek Middleton transmutes the world about him into one of his own making. It is a world of luminous colour, of limpid power, and unplumbed depths of light and darkness. Eddie’s of conflict, sudden eruptions and silent menacing structures.’ Middleton lived in Paris for a while,his New paintings at the Redfern Gallery in 1960 had a strong garden theme, all titles in French. 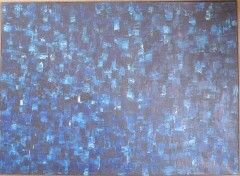 Middleton also exhibited in ‘Matavisual Tachist Abstract Painting in England’ held at the Redfern Gallery in 1957. The show also included painters such as Terry Frost, Victor Pasmore, Paul Feiler, Robin Denny, William Gear, Roger Hilton, Sandra Blow etc.